Friday morning Salt Springs Valley Reservoir was the first destination of David Harris, Ken Rutherford, and Tom Kilfoil. We wanted to get into some of the reservoir's bass as well as crappie. Some of the biggest crappie I have ever seen have come out of this lake. 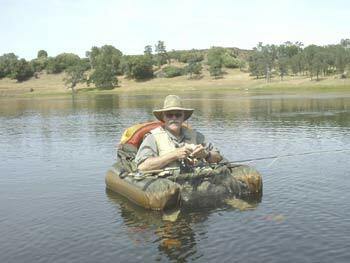 On a fish-out some years ago, Mike Pinelli and Roger Finke both caught some large crappie there. There is also a big perch in this lake called a red-eared perch. We float tube fished the lake all day without too much luck. Ken caught a twenty-two inch bass, but couldn't tell the weight because of no scale. I caught what for me looked like the biggest blue gill I'd ever caught, but it turned out to be a redear sunfish. We caught about a dozen bass between us, but only one crappieundefinedDavid let it go. All in all, not our best day of fishing, but not a bust either. We looked forward to meeting other club members at Robinson Lake the next day. Up early from a stay at Holiday Inn Express in Oakdale, we were ready to head to the ranch by 8 AM. We got there and got set up just as a SUV pulled in with George Conway, Phil Drees, and Rich Catanzaro and another SUV with Wayne Sutton and his friend Craig. Ken, David, and I decided to fish the upper lake first. We were all using poppers of some kind. I was using my balsa wood frog popper while David and Ken were using a weedless black foam popper that David had gotten from The Caddis Fly shop in Belmont. Both work well. 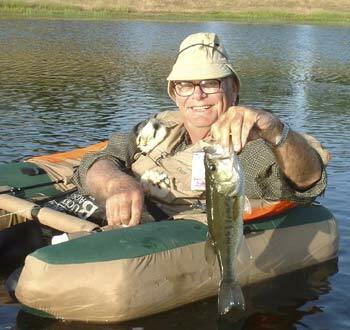 Ken caught his first bass on a popper, and then many more. David did very well with his popper as well as a pond smelt fly that Jay Fair had tied for Eagle Lake trout. He caught bass, crappie, and a bluegill with it. I had a very good day, catching twenty bass on the top lake and then after lunch catching another ten on the lower lake, all on poppers. My tally was twenty-five on the frog popper and five more on one of the black foam poppers given to me by David. I sure like the weedless feature and will try it on some of my own in the future. David did very well, as did Ken. George Conway was also catching fish on the upper lake near the dam and rock island. Everyone caught fish, making this a very worthwhile fish-out. We sure enjoyed this bass fishing. 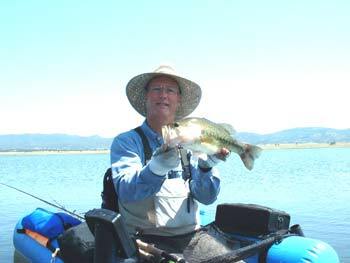 Bass fishing is a great change of pace from trout fishing. Give it a try. Check out these bass poppers. View a teriffic close-up picture of a crappie. It's a big download, be patient.